The genetic code allows an organism to translate the genetic information found in its chromosomes into usable proteins . Stretches of deoxyribonucleic acid (DNA) are built from four different nucleotide bases, while proteins are made from twenty unique subunits called amino acids . This numerical disparity presents an interesting problem: How does the cell translate the genetic information in the four-letter alphabet of DNA into the twenty-letter alphabet of protein? The conversion code is called the genetic code. In addition, a ribosome must know where to start synthesizing a protein on an mRNA molecule and where to stop, and start and stop signals require their own RNA sequences. A series of experiments carried out in the 1960s confirmed these mathematical speculations, and went on to determine which triplet sequence (called a codon ) specifies which amino acid. Indeed, the genetic code uses codons of three bases each, such as ACC or CUG. Therefore, the protein synthesis machinery reads every triplet of bases along the mRNA and builds a chain of amino acids—a protein—accordingly. Reading triplets, however, would allow a ribosome to start at any one of three positions within a given triplet (see Fig. 1). 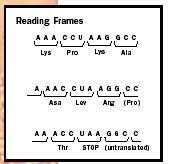 The position that the ribosome chooses is based on the location of the start signal and is called the "reading frame." Experiments have shown all but three of the sixty-four possible codons that A, G, U, and C specify code for one amino acid each. This means that most amino acids are encoded by more than one codon. In other words, the genetic code is said to be redundant or degenerate. This redundancy allows the protein-synthesizing machinery of the cell to get by with less, as will be seen below. The three that don't, the "nonsense" codons, indicate the end of the protein-coding region of an mRNA, and are termed stop codons. Figure 1. The genetic code reads codons of three bases each and builds a chain of amino acids accordingly. In any mRNA molecule, one codon always marks the beginning of a protein. 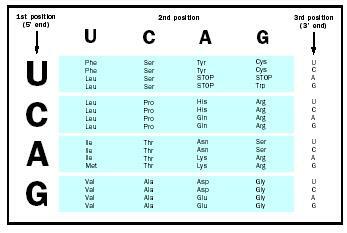 That "start" codon is usually AUG in both eukaryotes and prokaryotes , although eukaryotes use GUG on rare occasions. AUG codes for the amino acid methionine. To start synthesizing at an AUG, however, ribosomes require more information besides a start codon; this information is found in the sequence surrounding the initial AUG. AUG codons in the middle of a protein-coding sequence are translated like any other codon. Three codons signal the end of the mRNA template. These so-called stop codons, UAA, UAG, and UGA, do not code for any amino acid. Instead, the ribosome gets stuck, waiting for the tRNA that never comes, and eventually falls off, releasing the newly synthesized protein. The complementary sequence of a codon found on a tRNA molecule is called its anticodon. The tRNA molecule matches up its anticodon with the correct codon on the mRNA. A tRNA molecule holds an amino acid in one of its molecular arms and works with the ribosome to add its amino acid to the protein being synthesized. Each tRNA is then reloaded with its specific amino acid by an enzyme in the cytosol . Codons that code for the same amino acid are called redundant codons. The first two bases of redundant codons are usually the same and the third is either U or C, or alternatively A or G. For example, two redundant codons for the amino acid arginine are CGU and CGC, both of which pair with the same tRNA, despite having different third bases. This characteristic of the codon-anticodon interaction is called "wobble," and it allows organisms to have fewer than sixty-four distinct tRNA genes. In some tRNAs, wobble is made possible by a modified base within the anticodon. This modified base is called inosine (designated by I) and is made from adenine. Figure 2. The universal genetic code. the genetic code is said to be universal. The universality of the genetic code strongly implies a common evolutionary origin to all organisms, even those in which the small differences have evolved. These include a few bacteria and protozoa that have a few variations, usually involving stop codons. Mammalian mitochondria , which contain DNA, use the codon UGA not as a stop signal but instead to specify the amino acid tryptophan, and they have four stop codons instead of three. Also, the modified base inosine is not used in mitochondrial anticodons. Mitochondrial genetic codes from different organisms can also be distinct from each other as well as from the universal code, reflecting both their ancient bacterial origins and their long isolation within their host species. Creighton, Thomas E. Proteins: Structures and Molecular Properties, 2nd ed. New York: W. H. Freeman, 1993. Freifelder, David. Molecular Biology, 2nd ed. Boston: Jones & Bartlett, 1987. Lehninger, Albert L. Principles of Biochemistry, New York: Worth Publishers, 1982.